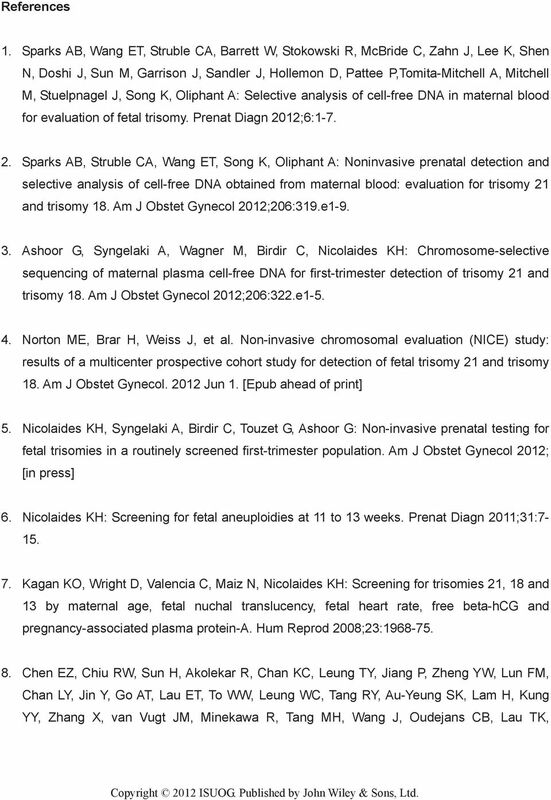 Download "Trisomy 13 detection in the first trimester of pregnancy using a chromosome-selective cell-free DNA analysis method"
2 Abstract Objective: To assess the performance of chromosome-selective sequencing of maternal plasma cell-free DNA (cfdna) in non-invasive prenatal testing (NIPT) for trisomy 13. Study design: Two phase case-control study on a single plasma sample per case. 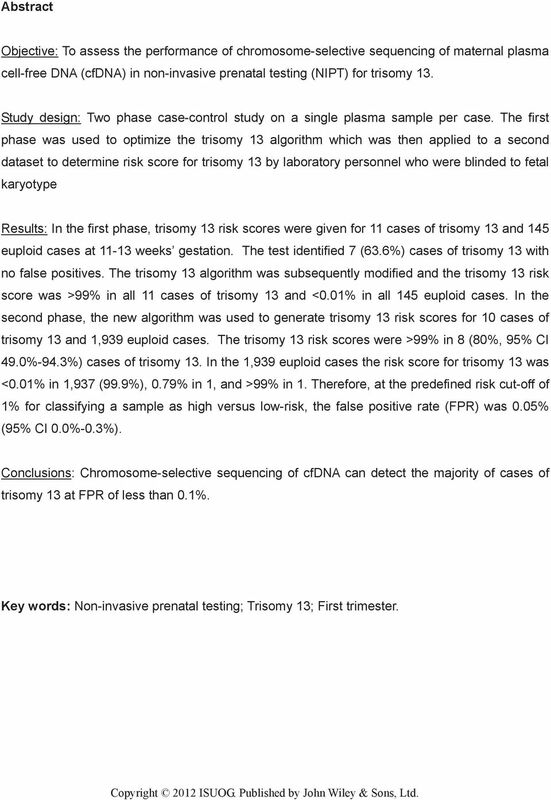 The first phase was used to optimize the trisomy 13 algorithm which was then applied to a second dataset to determine risk score for trisomy 13 by laboratory personnel who were blinded to fetal karyotype Results: In the first phase, trisomy 13 risk scores were given for 11 cases of trisomy 13 and 145 euploid cases at weeks gestation. The test identified 7 (63.6%) cases of trisomy 13 with no false positives. The trisomy 13 algorithm was subsequently modified and the trisomy 13 risk score was >99% in all 11 cases of trisomy 13 and <0.01% in all 145 euploid cases. In the second phase, the new algorithm was used to generate trisomy 13 risk scores for 10 cases of trisomy 13 and 1,939 euploid cases. 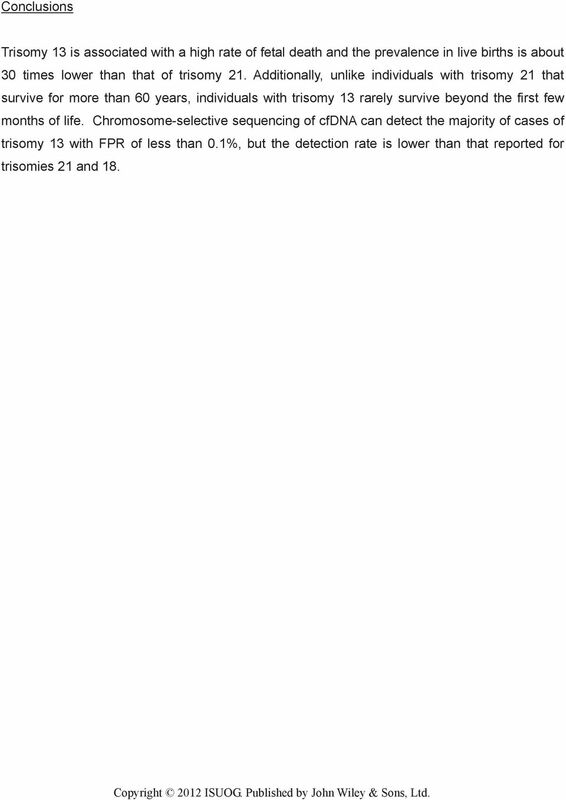 The trisomy 13 risk scores were >99% in 8 (80%, 95% CI 49.0%-94.3%) cases of trisomy 13. In the 1,939 euploid cases the risk score for trisomy 13 was <0.01% in 1,937 (99.9%), 0.79% in 1, and >99% in 1. Therefore, at the predefined risk cut-off of 1% for classifying a sample as high versus low-risk, the false positive rate (FPR) was 0.05% (95% CI 0.0%-0.3%). Conclusions: Chromosome-selective sequencing of cfdna can detect the majority of cases of trisomy 13 at FPR of less than 0.1%. Key words: Non-invasive prenatal testing; Trisomy 13; First trimester. 3 Introduction Chromosome-selective sequencing of loci from chromosomes 21 and 18 in maternal plasma cell-free DNA (cfdna) has been successfully applied in non-invasive prenatal testing (NIPT) for fetal trisomies 21 and 18 [1-5]. In pregnancies with a trisomic fetus, the incremental cfdna molecules derived from the extra fetal chromosome can be detected given the higher proportion of molecules relative to a reference disomic chromosome. 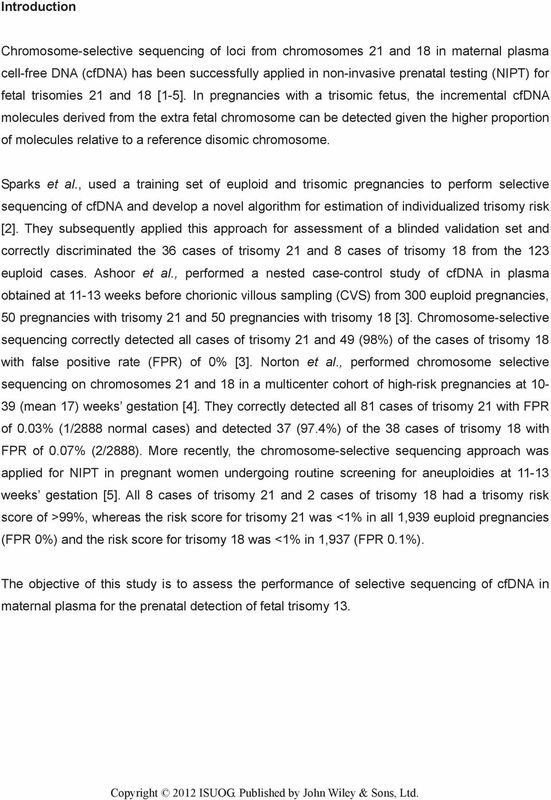 Sparks et al., used a training set of euploid and trisomic pregnancies to perform selective sequencing of cfdna and develop a novel algorithm for estimation of individualized trisomy risk . They subsequently applied this approach for assessment of a blinded validation set and correctly discriminated the 36 cases of trisomy 21 and 8 cases of trisomy 18 from the 123 euploid cases. Ashoor et al., performed a nested case-control study of cfdna in plasma obtained at weeks before chorionic villous sampling (CVS) from 300 euploid pregnancies, 50 pregnancies with trisomy 21 and 50 pregnancies with trisomy 18 . Chromosome-selective sequencing correctly detected all cases of trisomy 21 and 49 (98%) of the cases of trisomy 18 with false positive rate (FPR) of 0% . Norton et al., performed chromosome selective sequencing on chromosomes 21 and 18 in a multicenter cohort of high-risk pregnancies at (mean 17) weeks gestation . They correctly detected all 81 cases of trisomy 21 with FPR of 0.03% (1/2888 normal cases) and detected 37 (97.4%) of the 38 cases of trisomy 18 with FPR of 0.07% (2/2888). More recently, the chromosome-selective sequencing approach was applied for NIPT in pregnant women undergoing routine screening for aneuploidies at weeks gestation . All 8 cases of trisomy 21 and 2 cases of trisomy 18 had a trisomy risk score of >99%, whereas the risk score for trisomy 21 was <1% in all 1,939 euploid pregnancies (FPR 0%) and the risk score for trisomy 18 was <1% in 1,937 (FPR 0.1%). 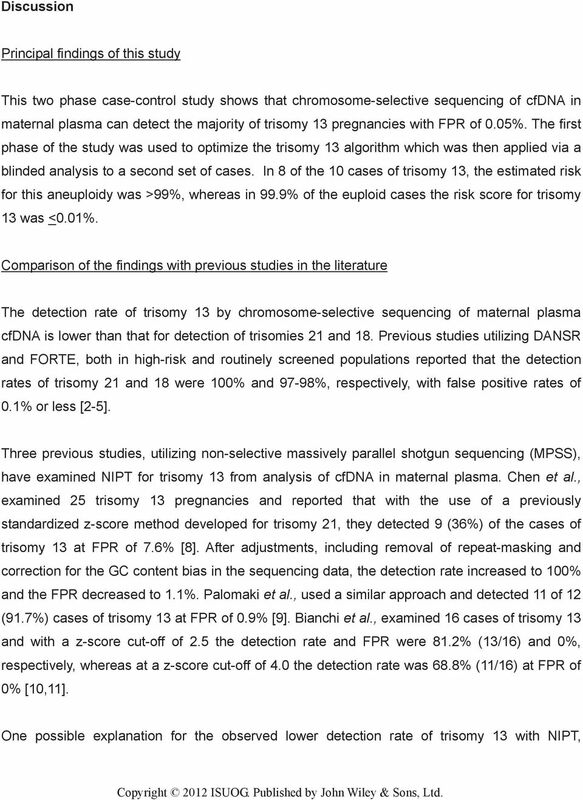 The objective of this study is to assess the performance of selective sequencing of cfdna in maternal plasma for the prenatal detection of fetal trisomy 13. 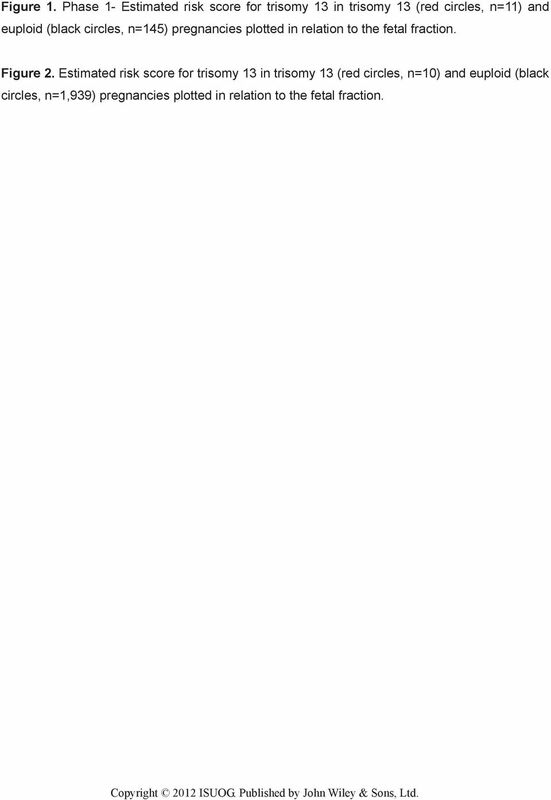 5 purification kit (Dynal) protocol, with minor modifications as previously described [1,2]. 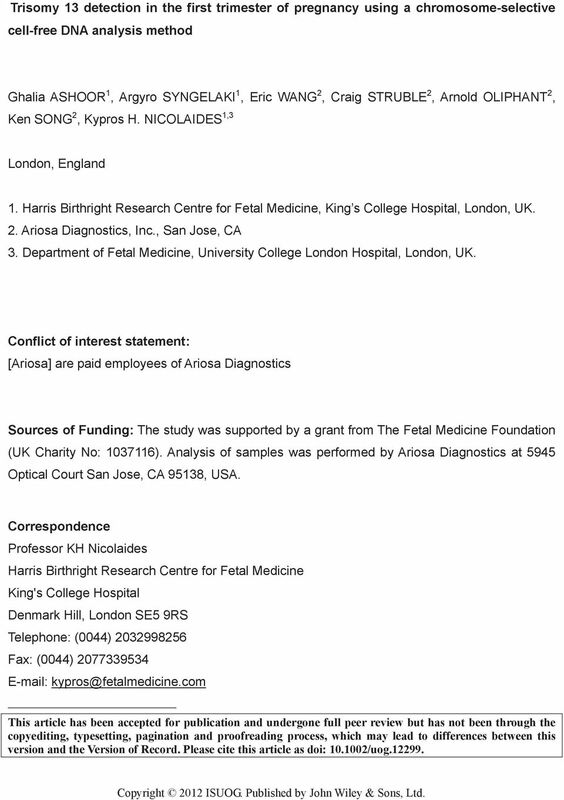 Trisomy analysis A single aliquot of plasma for each case that met minimum fetal fraction concentration of 4% was analyzed by laboratory personnel at Ariosa Diagnostics who were blinded to trisomy status. Fetal fraction was determined as previously described . Samples were analyzed with the DANSR assay and FORTE algorithm as previously described with the addition of 576 nonpolymorphic loci on chromosome 13 to the existing non-polymorphic loci on chromosomes 18 and 21 as part of the DANSR assay [1,2]. Briefly, this method uses ligation of locus-specific oligonucleotides to produce a sequencing template only from selected genomic loci, thus reducing the amount of DNA sequencing needed. 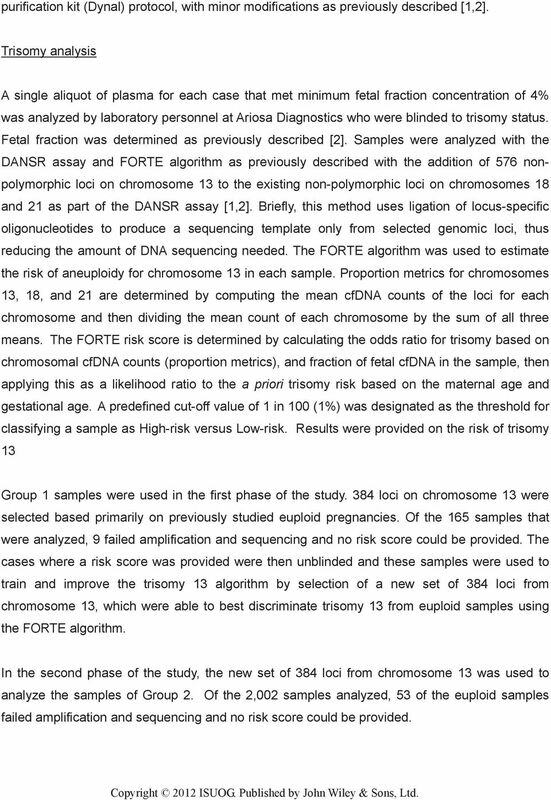 The FORTE algorithm was used to estimate the risk of aneuploidy for chromosome 13 in each sample. Proportion metrics for chromosomes 13, 18, and 21 are determined by computing the mean cfdna counts of the loci for each chromosome and then dividing the mean count of each chromosome by the sum of all three means. The FORTE risk score is determined by calculating the odds ratio for trisomy based on chromosomal cfdna counts (proportion metrics), and fraction of fetal cfdna in the sample, then applying this as a likelihood ratio to the a priori trisomy risk based on the maternal age and gestational age. A predefined cut-off value of 1 in 100 (1%) was designated as the threshold for classifying a sample as High-risk versus Low-risk. 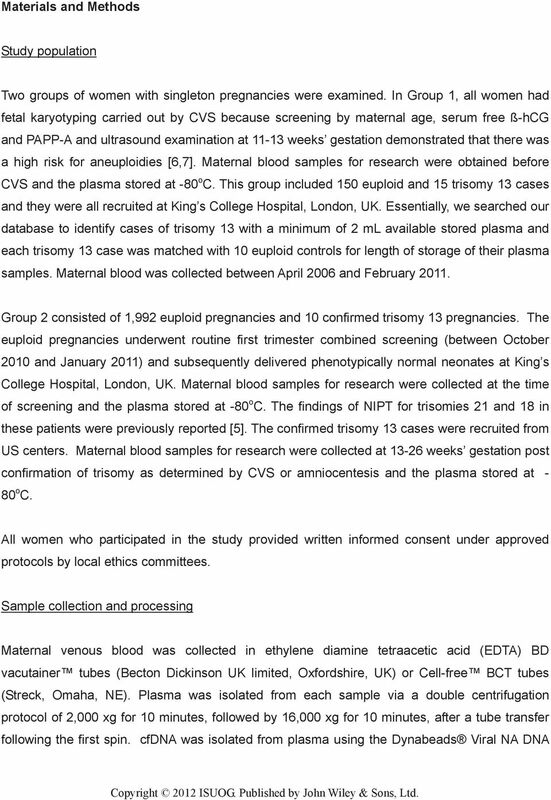 Results were provided on the risk of trisomy 13 Group 1 samples were used in the first phase of the study. 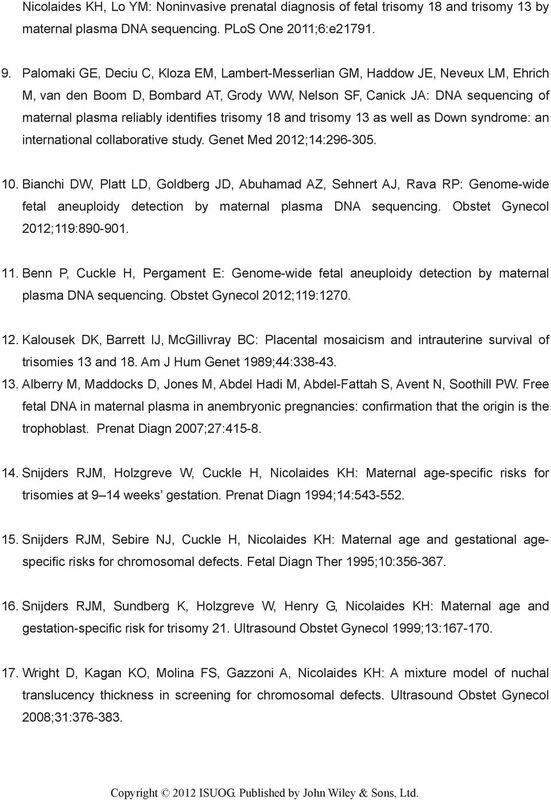 384 loci on chromosome 13 were selected based primarily on previously studied euploid pregnancies. Of the 165 samples that were analyzed, 9 failed amplification and sequencing and no risk score could be provided. The cases where a risk score was provided were then unblinded and these samples were used to train and improve the trisomy 13 algorithm by selection of a new set of 384 loci from chromosome 13, which were able to best discriminate trisomy 13 from euploid samples using the FORTE algorithm. In the second phase of the study, the new set of 384 loci from chromosome 13 was used to analyze the samples of Group 2. Of the 2,002 samples analyzed, 53 of the euploid samples failed amplification and sequencing and no risk score could be provided. 6 Statistical analyses Descriptive data were presented in median and standard deviation (SD) for continuous variables and in numbers and percentages for categorical variables (Table 1). Comparison between the outcome groups was by Fisher exact test for categorical variables and Mann-Whitney-U test for continuous variables. The statistical software R version was used for data analyses. 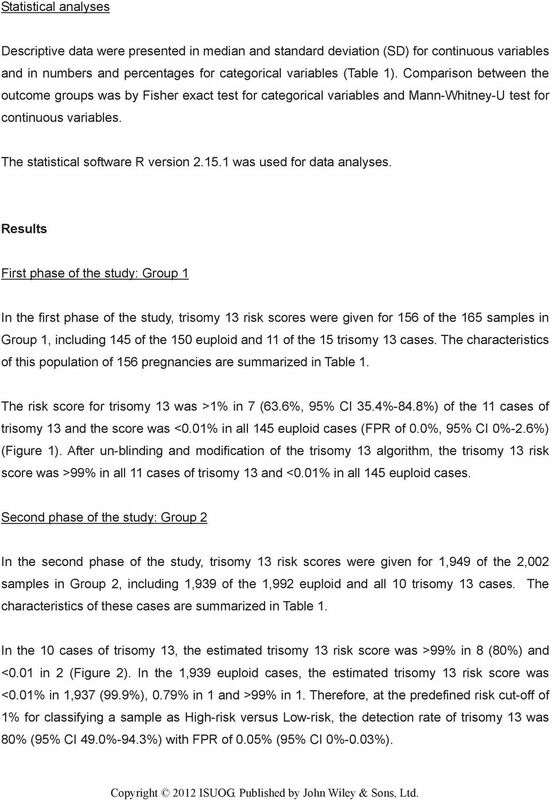 Results First phase of the study: Group 1 In the first phase of the study, trisomy 13 risk scores were given for 156 of the 165 samples in Group 1, including 145 of the 150 euploid and 11 of the 15 trisomy 13 cases. 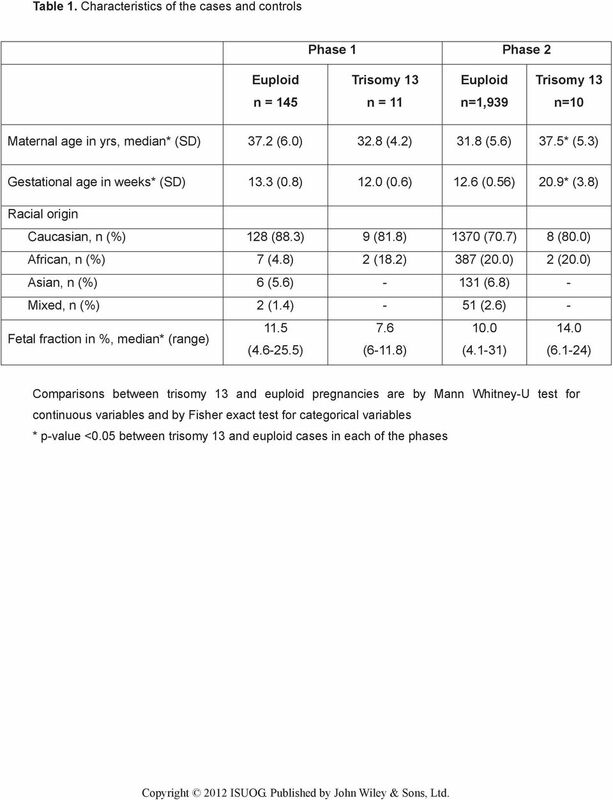 The characteristics of this population of 156 pregnancies are summarized in Table 1. The risk score for trisomy 13 was >1% in 7 (63.6%, 95% CI 35.4%-84.8%) of the 11 cases of trisomy 13 and the score was <0.01% in all 145 euploid cases (FPR of 0.0%, 95% CI 0%-2.6%) (Figure 1). After un-blinding and modification of the trisomy 13 algorithm, the trisomy 13 risk score was >99% in all 11 cases of trisomy 13 and <0.01% in all 145 euploid cases. Second phase of the study: Group 2 In the second phase of the study, trisomy 13 risk scores were given for 1,949 of the 2,002 samples in Group 2, including 1,939 of the 1,992 euploid and all 10 trisomy 13 cases. The characteristics of these cases are summarized in Table 1. In the 10 cases of trisomy 13, the estimated trisomy 13 risk score was >99% in 8 (80%) and <0.01 in 2 (Figure 2). In the 1,939 euploid cases, the estimated trisomy 13 risk score was <0.01% in 1,937 (99.9%), 0.79% in 1 and >99% in 1. Therefore, at the predefined risk cut-off of 1% for classifying a sample as High-risk versus Low-risk, the detection rate of trisomy 13 was 80% (95% CI 49.0%-94.3%) with FPR of 0.05% (95% CI 0%-0.03%). 8 compared to trisomy 21, is that in pregnancies with trisomy 13 fetuses there is placenta confined mosaicism with a high proportion of cells being disomic, whereas in trisomy 21 all placental cells are invariably trisomic . As the primary source of cfdna in the maternal circulation is thought to be the placenta , a mosaic placenta that is predominantly disomic would lead to a false negative result when using NIPT for trisomy13 detection. Likewise, a mosaic placenta that is predominantly trisomic in which the fetus is euploid could lead to a false positive result. 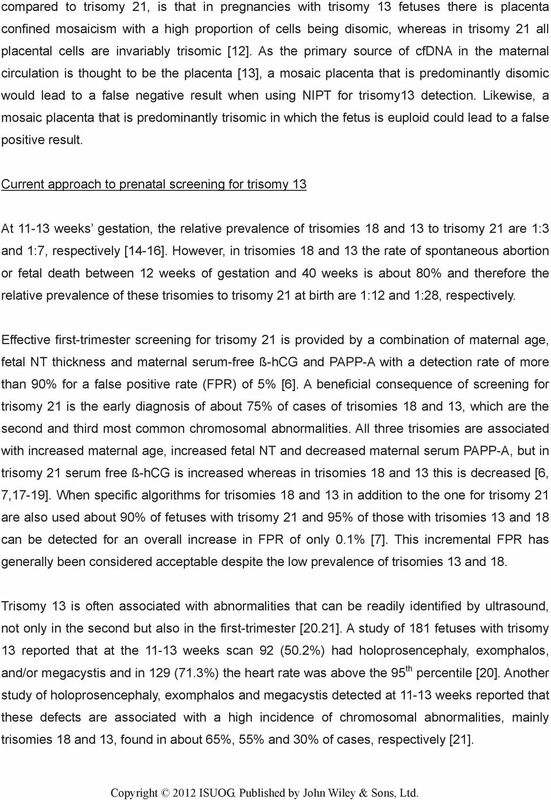 Current approach to prenatal screening for trisomy 13 At weeks gestation, the relative prevalence of trisomies 18 and 13 to trisomy 21 are 1:3 and 1:7, respectively [14-16]. However, in trisomies 18 and 13 the rate of spontaneous abortion or fetal death between 12 weeks of gestation and 40 weeks is about 80% and therefore the relative prevalence of these trisomies to trisomy 21 at birth are 1:12 and 1:28, respectively. Effective first-trimester screening for trisomy 21 is provided by a combination of maternal age, fetal NT thickness and maternal serum-free ß-hCG and PAPP-A with a detection rate of more than 90% for a false positive rate (FPR) of 5% . A beneficial consequence of screening for trisomy 21 is the early diagnosis of about 75% of cases of trisomies 18 and 13, which are the second and third most common chromosomal abnormalities. All three trisomies are associated with increased maternal age, increased fetal NT and decreased maternal serum PAPP-A, but in trisomy 21 serum free ß-hCG is increased whereas in trisomies 18 and 13 this is decreased [6, 7,17-19]. When specific algorithms for trisomies 18 and 13 in addition to the one for trisomy 21 are also used about 90% of fetuses with trisomy 21 and 95% of those with trisomies 13 and 18 can be detected for an overall increase in FPR of only 0.1% . This incremental FPR has generally been considered acceptable despite the low prevalence of trisomies 13 and 18. Trisomy 13 is often associated with abnormalities that can be readily identified by ultrasound, not only in the second but also in the first-trimester [20.21]. A study of 181 fetuses with trisomy 13 reported that at the weeks scan 92 (50.2%) had holoprosencephaly, exomphalos, and/or megacystis and in 129 (71.3%) the heart rate was above the 95 th percentile . Another study of holoprosencephaly, exomphalos and megacystis detected at weeks reported that these defects are associated with a high incidence of chromosomal abnormalities, mainly trisomies 18 and 13, found in about 65%, 55% and 30% of cases, respectively . 9 Implications for practice The performance of NIPT in screening for both trisomy 21 and trisomy 18 is far superior to that of currently available screening methods with a substantial increase in detection rate and decrease in FPR [5,6]. A study of NIPT with a chromosome-selective sequencing approach in pregnant women undergoing routine screening for aneuploidies at weeks gestation reported that the estimated trisomy risk score was >99% in all cases of trisomy 21 and trisomy 18 and <1% in 99.9% of the euploid cases . 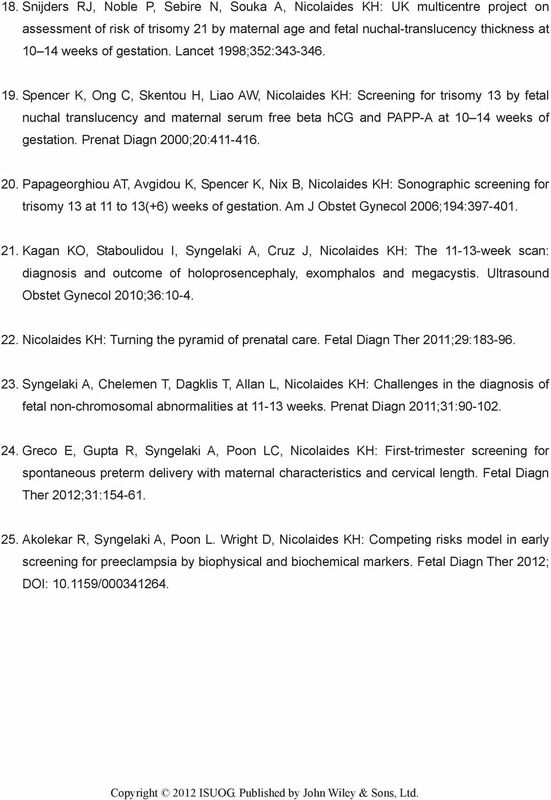 This study has shown that NIPT is also useful in screening for trisomy 13. Although the total number of cases of trisomy 13 examined is too small for accurate assessment of detection rate, the FPR was only 0.05%. Consequently, if the NIPT result is positive for trisomy 13 there is a 1600-fold (80/0.05) increase in risk for this trisomy and therefore such patients should be offered the option of invasive diagnostic testing. 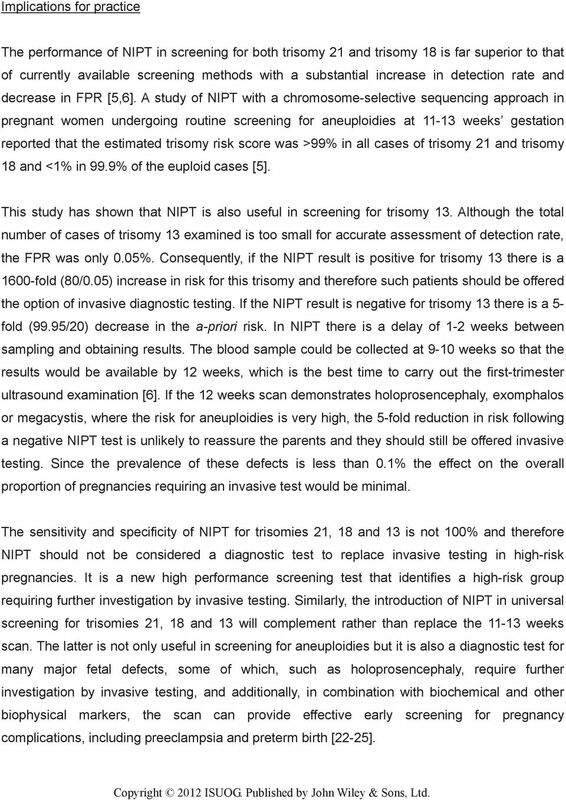 If the NIPT result is negative for trisomy 13 there is a 5- fold (99.95/20) decrease in the a-priori risk. In NIPT there is a delay of 1-2 weeks between sampling and obtaining results. The blood sample could be collected at 9-10 weeks so that the results would be available by 12 weeks, which is the best time to carry out the first-trimester ultrasound examination . If the 12 weeks scan demonstrates holoprosencephaly, exomphalos or megacystis, where the risk for aneuploidies is very high, the 5-fold reduction in risk following a negative NIPT test is unlikely to reassure the parents and they should still be offered invasive testing. Since the prevalence of these defects is less than 0.1% the effect on the overall proportion of pregnancies requiring an invasive test would be minimal. The sensitivity and specificity of NIPT for trisomies 21, 18 and 13 is not 100% and therefore NIPT should not be considered a diagnostic test to replace invasive testing in high-risk pregnancies. It is a new high performance screening test that identifies a high-risk group requiring further investigation by invasive testing. Similarly, the introduction of NIPT in universal screening for trisomies 21, 18 and 13 will complement rather than replace the weeks scan. The latter is not only useful in screening for aneuploidies but it is also a diagnostic test for many major fetal defects, some of which, such as holoprosencephaly, require further investigation by invasive testing, and additionally, in combination with biochemical and other biophysical markers, the scan can provide effective early screening for pregnancy complications, including preeclampsia and preterm birth [22-25]. 10 Conclusions Trisomy 13 is associated with a high rate of fetal death and the prevalence in live births is about 30 times lower than that of trisomy 21. Additionally, unlike individuals with trisomy 21 that survive for more than 60 years, individuals with trisomy 13 rarely survive beyond the first few months of life. Chromosome-selective sequencing of cfdna can detect the majority of cases of trisomy 13 with FPR of less than 0.1%, but the detection rate is lower than that reported for trisomies 21 and 18. 12 Figure 1. 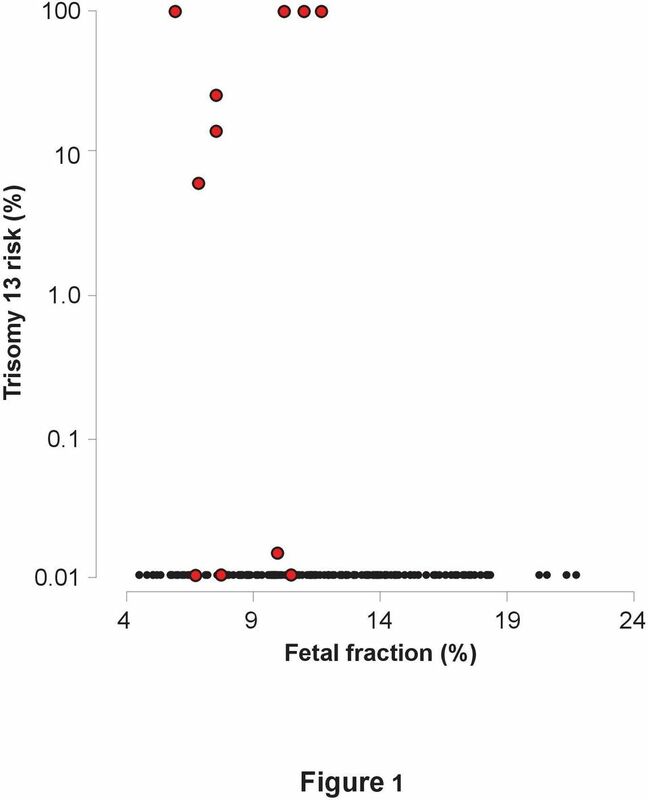 Phase 1- Estimated risk score for trisomy 13 in trisomy 13 (red circles, n=11) and euploid (black circles, n=145) pregnancies plotted in relation to the fetal fraction. Figure 2. 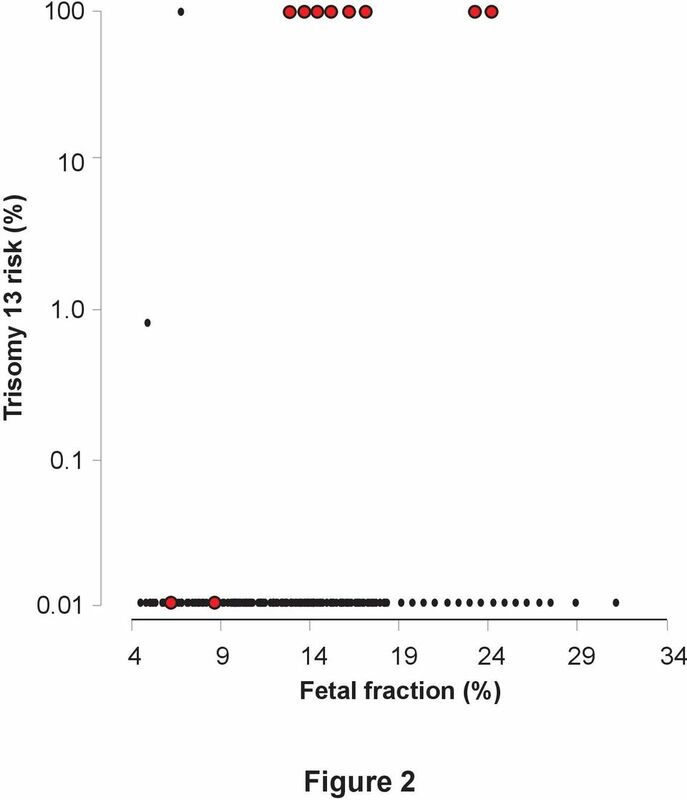 Estimated risk score for trisomy 13 in trisomy 13 (red circles, n=10) and euploid (black circles, n=1,939) pregnancies plotted in relation to the fetal fraction.